Hello everyone! 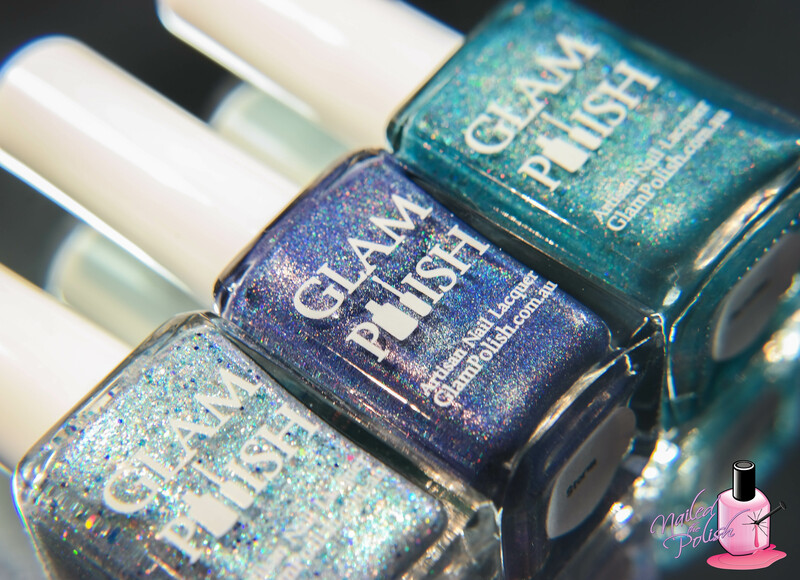 Today I have a very, very exciting post for you all – swatches of Glam Polish‘s limited edition Got The Blues Trio! This limited edition trio consists of three holographic polishes each in a different shade(s) of blue which launches Saturday, August 1st. All swatches were taken indoors under a combination of cree daylight and LED bulbs. 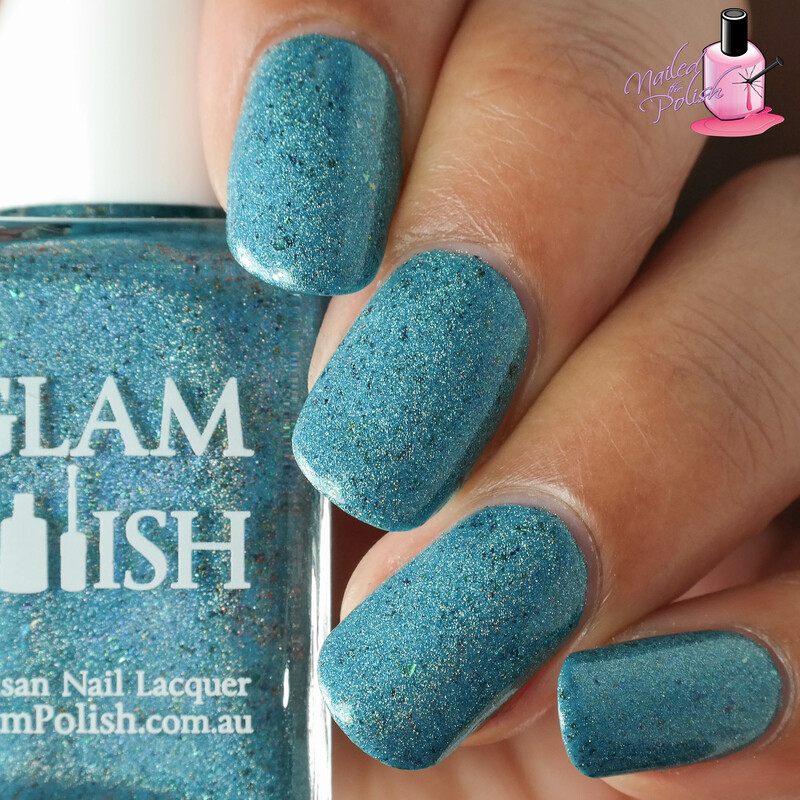 Paradise is a perfect aqua blue holo with turquoise glass flecks and blue/green flakies. Shown here is two coats plus top coat. This polish was almost opaque in one coat! The formula is seriously to die for! Not too thick, not too thin, very easy to control, and has a great drying time. I die with anything aqua and anything holo so I am head to toe dying over this polish! If this isn’t paradise… then I don’t know what is! Storm is an indigo ultra holo with violet and indigo glass flecks. Shown here is two coats plus top coat. This polish is so holographic that I could barely see the glass flecks – not that that’s a bad thing! Just like Paradise, amazing formula! This polish is one that I would classify as “blurple” because in some lighting it was indigo but in others it was almost a sapphire shade. Just look at that holo! If you look really closely, you can see some of those glass flecks scattered across my nail. Ice Palace is a sapphire, ocean, turquoise, silver and sky blue holo glitter in a holographic base with glass flecks and bright blue shimmer. Shown here is two coats plus top coat. O-M-G! This polish is breath taking! 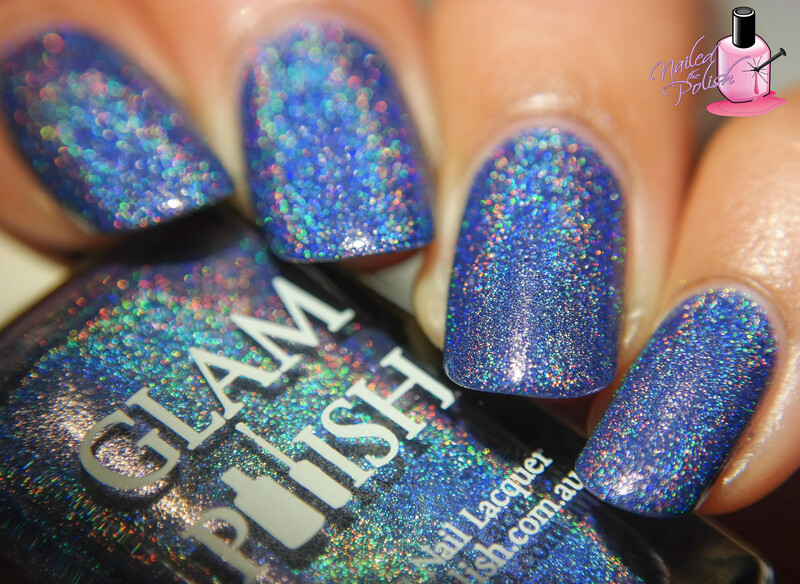 The shimmer, the holo base, the holo glitters – I. Just. Can’t. ❤ Side note: I’m a huge Disney fan. The whole time I was wearing this polish I couldn’t help but think that this would be Elsa’s go-to shade lol! This polish is a little thick due to all of the glitters but overall it has a good application. Plus where it lacks in application, it makes up for in dry time and leveling! Is this or is this not Elsa in a bottle?! Love. Love. LOVE! I usually find that in a duo or trio there is always one polish that is okay compared to the others. Well, not with this trio! Each polish is spectacular on it’s own and together they make for the most amazing blue trio! Of the three, Ice Palace is my favorite but the other two are not far behind! As always, I am very impressed with this Glam Polish collection! As stated above, this trio will release on Saturday, August 1st at 1pm EDT. Also releasing is the Under the Sea collection which is also to die for! Both collections will be available for purchase here. 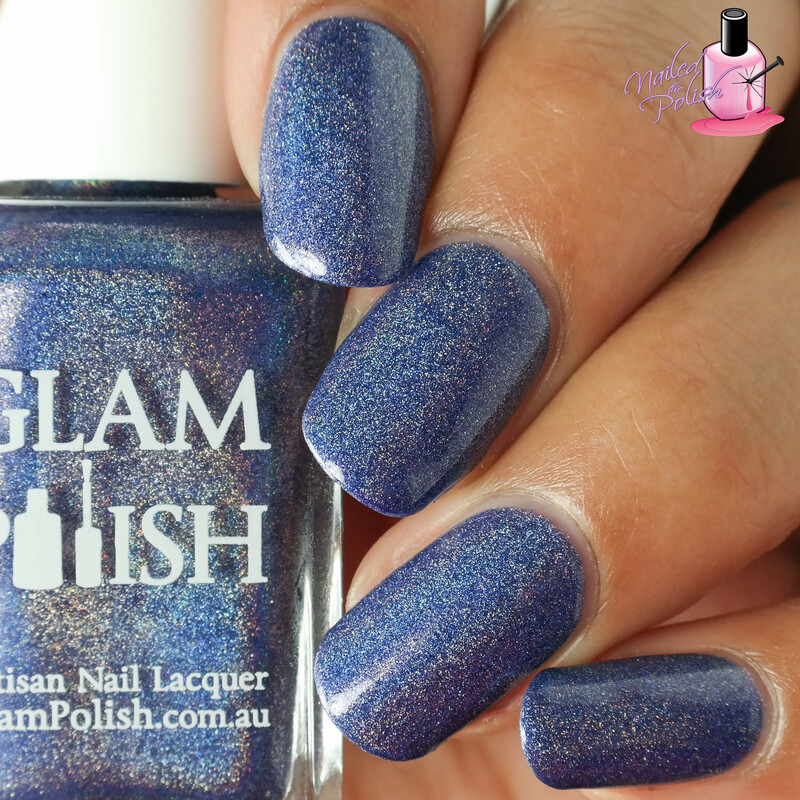 Currently, Glam Polish ships to Australia, USA, and France (currently on a trial period). Shipping rates are as follows for USA and France. $3.50 USD for the first polish and an extra $1.00 USD for each additional polish. All polishes to France will be shipped from the USA by USPS. $26 USD for the first polish and an extra $0.75 USD for each extra polish up to a maximum of 18 nail polishes per order. This price includes handling fees and orders are shipped by priority mail with tracking.